In Tibetan Buddhism, a thangka is a religious painting on a scroll typically made from cotton or silk appliqué. A thangka usually depicts a Buddhist deity, scene or mandala. Thangkas are traditionally kept unframed and rolled up when not on display, mounted on a textile backing in the style of Chinese scroll paintings, with a silk cover on the front. So treated, thangkas can last a long time, but because of their delicate nature, they have to be kept in dry places where moisture won't affect the quality of the silk. Most thangkas are relatively small, but they can be extremely large. 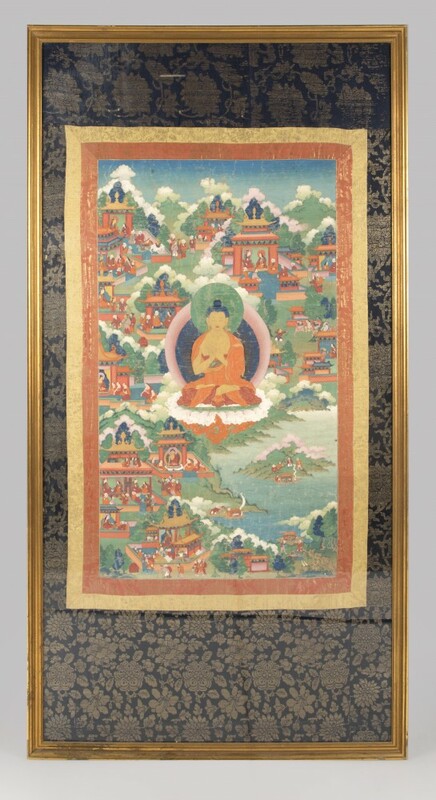 The thangka shown here is an 18th century Sino-Tibetan example, depicting the Buddha surrounded by scenes from his former lives. It was offered in John Moran Auctioneers' September 24, 2016 Decorative Art Auction, where it was assigned an estimate of $3,000-$5,000. But a bidding war ensued between phone and online bidders, driving the final price to $39,000, making it the top lot of the sale. Most thangkas were intended for personal meditation or instruction of monastic students. They often have elaborate compositions, including many very small figures.